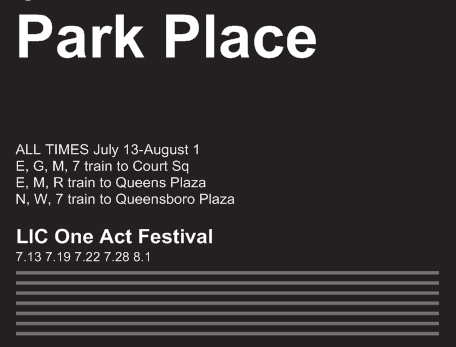 I (and the whole cast and creative team) hope to see you at one of our shows, and hope that you'll vote for Park Place to make it to the finals! If we do, the play will be published as part of the festival anthology and we sure would love to see our names in print! It would be pretty amazing to add "published playwright" to my resume! As always, if you're thinking of coming to the show, or even if you can't make it, I hope you will consider donating to our indiegogo campaign. Perks for donations of $25 or more include a free ticket to the show! Click on the photo below to make a contribution to support working artists. October 28/31 - The Monster's Ball at the MicKittrick Hotel, part of Sleep No More's monthly-ish SuperCinema series..
October 29 - Le Noir Ilumine with Cirque du Nuit (an immersive theatre company), a party produced by You Are So Lucky at the WB Thompson mansion in Yonkers, NY. December 5/6 - Gypsy of the Year performance with the cast/crew/family of Jersey Boys to celebrate our eleventh and final year on Broadway. The Gypsy of the Year folks invited Jersey Boys to perform this year in honor of their final year on Broadway (we close January 15th) and the cast decided, because the show's motto is "family is everything," that they wanted to include everybody - past cast members, touring companies, production crew, and the front of house team. So as an actor masquerading as an usher, I jumped at the opportunity to be a part of the performance at the New Amsterdam Theatre, regularly home to Aladdin. Collectively we were a group of over seventy, including a couple of babies born to the cast during the run. I was living my dreams rehearsing and performing with a talented group of people in front of an audience of over 1500 people. So it's been an exciting couple of months, and I'm excited to announce I'll be performing with Cirque du Nuit again for New Year's Eve! I wish you all the warmest and happiest of holidays, and let us all hope 2017 is better than 2016.